So long story short, I swapped my engine for an S13 CA18DET coming from an s12 CA18ET. I removed the S12 loom going on the driver side (LHD car) from the ECU to the connectors in the engine bay near the MAF. I used the complete S13 engine loom and wired all the needed wires to provide 12v const and earth to the S13 ECU. Then I used a relais to give switched 12v to all the ignition on 12v needed for the S13 ECU. For this ignition on signal I tapped of directly from the ignition switch, more specific the black/white wire. This seems to give ignition on signal, but when the engine is running and I turn off the ignition switch it still gives me 12V (when engine is not running, it switches correctly). So for some reason my ignition switch only switches correctly when the engine is turned off.. As if the ignition on wire of the S12 loom is getting 12v somewhere once the engine is running. Anyone has an idea where to look??? I left the S12 wiring alone, so I'm pretty mind blown and have overlooked my own wiring for several times. Plus it wouldn't make sense that my S13 wiring would be the cause since it doesn't "send" power to the S12 loom. The only thing I can think if is that there is a bad ground somewhere where the old plugs of the stock S12 loom meet up in the engine bay? You really need an fsm. Yeah, I seem to recall the Start Signal wire being orange. I believe there's PDF versions of the s12 tech manuals somewhere on this site. Use the custom search in the top right corner to find a wiring diagram so you know what s12 wires you're working with. The orange is the start-signal with the CA18DET ecu, that's correct and that's wired up to the black/yellow from the S12 ignition switch. 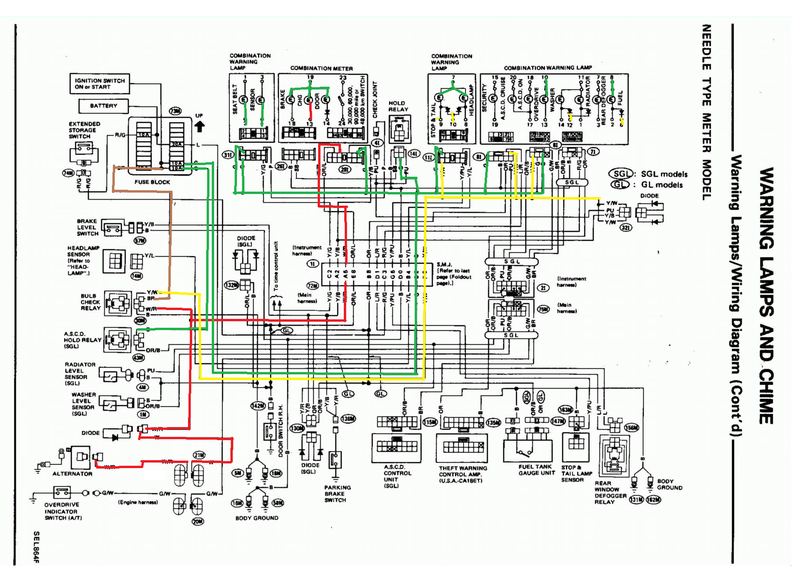 This way the S13 ECU knows when the engine is cranking. But I'm looking for a signal that stays 12V as long as the key is in the 'on position' and goes 0v when turned off. From what I can tell on page EF-12 and EF-13, the B/W wire should be ignition on. The Black/White wire on the S12 ignition switch gives 12V when the ignition is turned on and 0v when in off position (S13 ECU turns on fuel pump primes for 5sec like it should en stops when turning key in off position). UNLESS the engine is running, then for some reason it stays 12v even with the key out of the contact. Some extra information: when the engine is not running I get 12volt with ign on and 0v when ign switch is off. What's the constant voltage going to things like the clock, or the radio? Could your 3 volts be coming from one of those sources? Thanks for your input, I will check that later this evening and post my anwser here. I also wired the ignition on signal for my CA18DET harness directly to the battery with a switch in between, just to make sure. Like this the engine can be turned off with the switch as is expected.. So there is no mistake in my CA18DET wiring. I also discovered something that might lead me to the solution. When I unplug the bulb check relay, everything functions as it should be..
Is it normal to have 12volts on the orange wire coming going to the fuel pump? This goes back to the fuel warning light in the dash. Since it should give ground, I'm really confused to why this wire has 12volts on it.. Where could this come from. Maybe this info is very important to people in the future! Also leave in the fuel pump fuse in, because without this fuse some relays don't switch and the ignition off switch mode doesn't seem to be working. Really glad you were able to figure this out. Thanks for sharing and saving somebody time in the future.